Ukraine's Economy Plunges: So, Who Should Pay For It? According to Ukrainian news-accounts, Ukraine's economy is rapidly falling. On April 2nd was reported that “Sales of new cars in Ukraine fell to the lowest in 15 years,” and that March's sales-volume (number of cars sold) was 23% less than that in February. Even more startlingly, "The general decline in sales of vehicles in Ukraine in January-February 2015 compared to the same period in 2014 was 67%.” So, whenever comparisons go back not merely month-to-month but to the situation prior to the February 2014 coup by the Obama Administration in Ukraine (which was quite violent and surprised EU leaders, who knew nothing about it in advance), this automotive sales-decline is especially stark. Broad-based polling also supports the conclusion that the Ukrainian population are suffering from the consequences of Obama's 2014 coup. Ukraine's pro-Western Razumkov Center think-tank has periodically since 2004 (“the Orange Revolution”) asked Ukrainians, “Is the situation in Ukraine developing in a right or wrong direction?” The latest “right direction” score, March 2015, is 17.5%, which is the lowest such score in nearly three years. 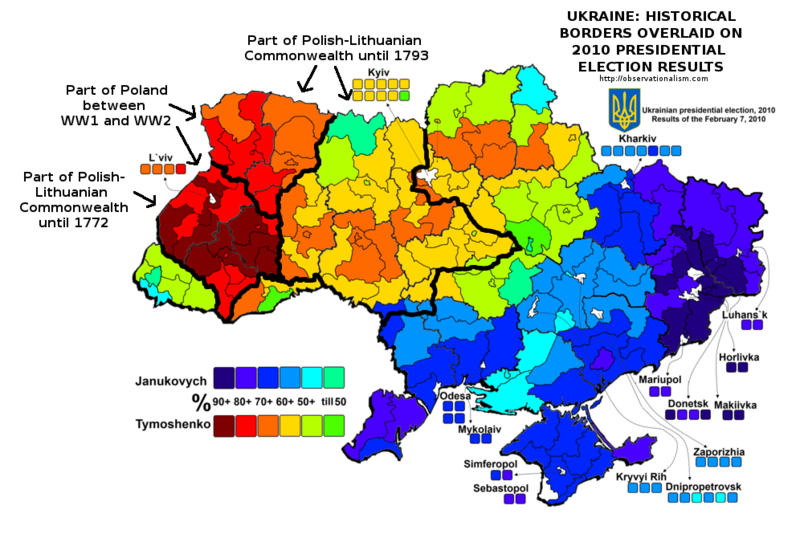 The highest score in the past 10 years was 41.3%, in June 2010, right after the man whom Obama overthrew in 2014, Viktor Yanukovych, was elected President. The second-highest such score was 26.1%, in December 2013, which was their first poll taken after Yanukovych had turned down the EU's offer because Ukraine's Academy of Sciences had calculated that it would cost Ukrainians $160 billion — it would destroy the economy. (Maybe their economists got that right, after all.) But, though the Ukrainian public were relieved at that rejection of the EU's offer, the U.S. CIA and the U.S. Ambassador to Ukraine were definitely not, and so they secretly organized public “Maidan” demonstrations against this turn-down, and used those public demonstrations as cover for their far-right, rabidly anti-Russian, mercenaries, to execute the actual coup, masked and cross-dressed as if they were government security forces shooting into the crowd so that the violence would be blamed on President Yanukovych. Here was Obama's agent, Victoria Nuland, on the phone on 4 February 2014, telling America's Ambassador in Kiev whom to get to be appointed to run the government after the coup; and her choice, “Yats,” was appointed 22 days later, on February 26th, and he still runs the country today, and probably for as long as Obama remains pleased with his performance. However, yet another Ukrainian news-report, this one on April 2nd, headlines, "Merkel pledges to support investments of German business in Ukraine,” and it notes that, during Chancellor Angela Merkel's joint press conference with Ukrainian Prime Minister Arseniy Yatsenyuk in Berlin on April 1st, she had said, "We talked about this a lot, and discussed ways that will encourage German companies to come to Ukraine,” not leave it. Already, $40 billion from EU and U.S. taxpayers, through the IMF and other financial intermediaries, are propping up the post-coup regime in Ukraine, and yet that sum is still less than investor George Soros claims is needed: $50 billion. And, so, various ways are being sought to leave Russia holding the bag for these losses, as much as possible (and at least to the tune of that needed additional $10 billion). On April 1st, Britain's Financial Times bannered, "Ukraine's debt haircut showdown looms,” and reported that "academics say another option might be for Ukraine to make Russia's debt unenforceable in English courts, arguing that Russia's annexation of Crimea should be set off against the debt.” That way, when Ukraine's citizens get their pensions and health care and other government-services cut back in order to pay the accumulated debts of the Ukrainian Government (which were largely pocketed by Ukraine's aristocrats or “oligarchs”), those debt-payments will end up going to the new, Western, (post-coup) investors, and not to the former, (pre-coup) Russian (and Chinese), ones. Western investors don't care about Ukrainians, but they absolutely hate Russians (and don't much like Chinese, either). Any money that's skimmed off of Ukrainian citizens should be heading westward, not eastward, they argue. Their chief argument right now is that Russia ‘stole' Crimea, and that therefore Russians forfeit any right to anything from Ukraine — including the tens of billions of dollars that Russians had lent to Ukraine before Obama's 2014 coup turned Ukraine into an anti-Russian military platform (for NATO missiles against Russia, according to the Obama Administration's plans and anti-Russian propaganda). Here is the reason why he was dismissing what the people who live in Crimea wanted (and which they wanted even more after the coup): he knows that they had sound reason to be especially terrified of the people whom the Obama Administration had placed in control of Ukraine, and that more than 90% of Crimeans were enormously relieved for Crimea to be restored as part of Russia, which it had been part of from 1783-1954. Libertarians (and economists) assume that all rights reduce down to the right to property. But America's Founders didn't even include that right among its list of concerns upon which the USA was actually founded. Instead of sovereignty residing in property, or even in propertyholders, it resides in the people, and only in them (regardless of whether, or how much, property they might happen to own). This is a fundamentally different view of the purpose of the State, and of government — the view that government exists for the ruled, and not for the rulers (not for the benefit of the aristocracy). That the rulers are merely the elected representatives of the people, and can be dismissed by them, at will, by the people. The RedCoats, the (troops hired by) British aristocracy in the 1700s, have apparently won the ideological war in more-recent times. Vladimir Putin will now necessarily be compelled by circumstances to decide whether or not he agrees with his former chief economic advisor on that fundamental matter; or, instead, with the Founders of the USA on it — this country which has unfortunately been subsequently conquered by a counter-revolution by the domestic aristocracy (especially after the Supreme Court's 2010 Citizens United decison), even without its people so much as knowing about (much less, understanding) the American counter-revolution that now is ruling us. I develop this discussion further (in economics, law, ideology, and morality) in my just-issued book, Feudalism, Fascism, Libertarianism and Economics. It explains how this counter-revolution was waged in America and then went on to win the ideological war world-wide — and what must now be done in order to reverse the aristocracy's victory and to restore democracy. But it's all summed up right here, in these very concrete news-events regarding Ukraine. Because: if what is at issue in government is the property, and not the people, then feudalism is again dominant, only under a more modern name. And that's the question and choice which is now at issue, regarding Ukraine, Crimea, Russia, and the future of the entire human species. This little piece of history, then, is just a microcosm of the whole, of our lives, and of those that will come after us. Investigative historian Eric Zuesse is the author, most recently, of They're Not Even Close: The Democratic vs. Republican Economic Records, 1910-2010, and of CHRIST'S VENTRILOQUISTS: The Event that Created Christianity, and of Feudalism, Fascism, Libertarianism and Economics.